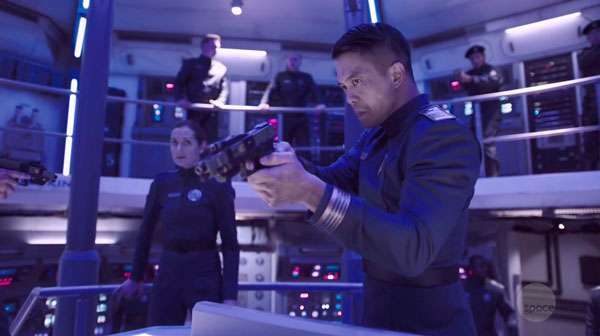 This week we discuss season 3 of The Expanse with the tenth episode titled “Dandelion Sky”. The episode opens with Alex and Amos discovering Holden has left. When the Shugen launces a skiff after Holden Amos calmly suggest they after them even though there’s no chance of reaching the Marines before they get to Jim. Alex is scared and he confronts Amos about his calm demeanour. The big man tells him he’s confused but not scared. He hasn’t felt fear since he was five years old. Alex envies him and says he wishes he didn’t feel fear. But Amos tells him no, you don’t. Alex is afraid, not only for himself but for all of humanity. Amos assures him that if they are all going to die, he’ll make sure to take Alex along with him. Meanwhile, on board the Belter skiff, Naomi is unable to connect with the Rocinante. An MCRN ship contacts her saying she’s interfering with a police action and orders her to turn back. Outside the Ring, the Thomas Prince prepares for its trip inside. Lieutenant Jordan Nemeroff_ approaches Anna as a member of her faith. Preoccupied with what is going on around them, Anna doesn’t pay much attention to what he has to say and brushes him off when he asks her about God’s will and their being there. Through the Ring, Anna is enraptured by what they are seeing. She surmises that anything that the Ring sees as a threat, such as objects moving too fast, are isolated like the body does to a cyst. Tilly shivers at the thought that the Ring may be sentient. Lieutenant Nemeroff also seems ill at ease with the thought. He retreats to his cabin, puts his sidearm in his mouth and pulls the trigger. Anna is later shocked at discovering the news, recognizing the lieutenant’s earlier plea for help for what it was. She’s blaming herself for what transpired. She’s there to be a minister, not a scientist. At Jordan’s memorial, Anna comforts his friends, telling them that they are all there for each other and should offer help whenever possible. Elsewhere on board, Clarissa is trying to figure out a way to get to the Rocinante before it is intercepted by the Mars ship but there are no possible options available to her. As a plan B, she researches how to make the Roci’s reactor core go critical. When Tilly recognizes and confronts Clarissa offering to help her with whatever problem she’s hiding from. So close to her goal. Clarissa activates the device in her mouth and attacks Tilly. On the Behemoth, Ashford loudly voices his objections to Drummer letting Naomi leave. Diogo tells Ashford that he should be the captain. Ashford tells his young lieutenant to tread carefully with what he says. Later, in private, Drummer calls Ashford out for undermining her in front of the crew. She knows things are coming to a head and it’s only a matter of time before there’s a mutiny. A dropship with a squad of Marines including Bobby Draper persues Holden towards the Nucleus. Her Lieutenant questions Bobbie’s willingness to apprehend Holden but she assures him she has every intention of carrying out her orders. When Holden doesn’t acknowledge their attempts at hailing him, Bobbie gives it a try and succeeds. She’s concerned by what she hears. Holden seems to be talking nonsense with someone else. The Marines deduce that he’s cracked. They prepare to go in hot and retrieve their target. 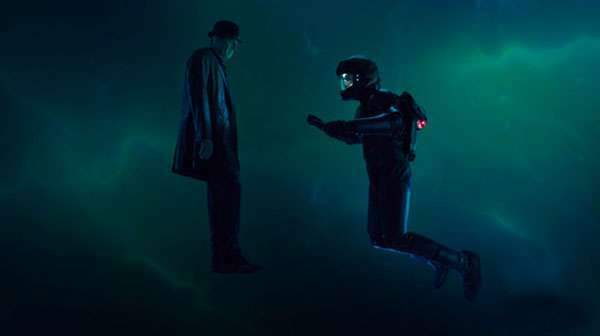 On his way to the nucleolus, Holden holds a conversation with Miller who is floating, without an EVA suit in front of him. They discuss whether or not Holden’s actions are his own or if he’s following some programming. When Jim spots the Marines on an intercept course he speeds up. The Nucleus opens up but Holden hesitates to enter. Miller tells him there used to be a civilization there but now it’s just a bunch of locked doors. With the Marines approaching, Jim enters. Miller tells him there’s something he needs Jim to do. The doors leading to the records are locked and he needs Holden to turn the key. They reach the center and Miller asks Holden to complete a circuit and unlock the records but Jim is hesitant. What if unlocking it causes harm to humanity. Miller confides in Jim that he was afraid to die on Eros, but knowing he was with Julie made it easier. The Marines arrive and order Holden to come with them. When he makes a lunge to complete the circuit the Marines opens fire but their bullets are stopped mid-air. The room itself responds and the Lieutenant fires a grenade. The Nucleolus grabs the lieutenant, tears him apart and absorbs him while also drastically reducing the speed limit within the Ring. Holden uses the distraction to complete the circuit, showing him a vision taking him back in time. He’s inside a Ring with many openings, each one with a solar system behind it. Some of the solar systems vanish, other’s the ring disappears, and more are taken over by the Protomolecule as it reaches out through the Rings and takes them over. It’s too much for Holden. He removes his hand and collapses.